Fits inside face bolt recess to support back side of the extractor rivet while you peen the other end to lock a new extractor in place. Just like the one Remington uses with one "cut" added for better support when clamping in the vise. SPECS: Blued, tool steel, hardened to Rc 60-63. 2-¼" (5.7cm) high x 1-¾" (4.4cm) wide x ½" (12.7mm)thick. Passer inne ansikt bolt fordypningen støtte baksiden av extractor klinke mens du peen den andre enden for å låse en ny komfyr på plass. Akkurat som den bruker Remington med en "cut" lagt for bedre støtte når clamping i skruestikken. Spesifikasjoner: blånert, verktøy stål, herdet til Rc 60-63. 2-¼"(5.7 cm) høy x 1-¾" (4.4 cm) bred x ½"(12 mm) tykk. A handy little piece that makes the finished job look 'factory' perfect! Holds the rivet in place so you can peen it properly. All that is left to do is polish the outside of the bolt and you're done. Once again, the right tool for the job. Simple, easy to use, solid and should last for years. Beats the shop made tool I've been using, and one person can do it. Not a very versatile tool, will do exactly the one job it was designed for. But, with so many Remington pumps, semi-autos and bolts in the world that use the riveted extractor, it will get used. 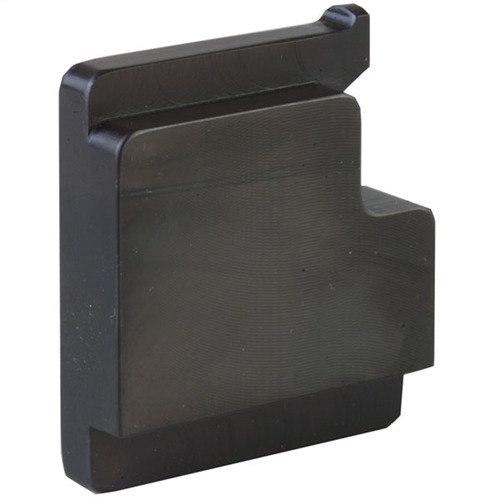 Remington Rifle Extractor Rivet Anvil 050806108851 Passer inne ansikt bolt fordypningen støtte baksiden av extractor klinke mens du peen den andre enden for å låse en ny komfyr på plass. Akkurat som den bruker Remington med en "cut" lagt for bedre støtte når clamping i skruestikken.